UCV 61st and Final Reunion First Day Cover 1951. Official cachet - Genl. Lee and multicolor Confederate flags. Printed signature of last Commender in Chief (James W. Moore) UCV who died just before the Convention, hence printed signature. Postmarked on the Day of Issue May 30,1951 at Norfolk, VA. site of the Convention. 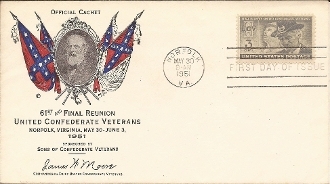 Cachet printed and designed by noted Confederate philatelist August Dietz. VF.